A Thai military spokesman has denied any possibility that the army was responsible for Monday's attack on a mosque in the south of the country. 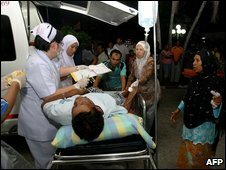 At least 10 people died in the Narathiwat shootings, which happened during evening prayers. Islamic militants are thought to be behind many of the attacks in the area, as part of a separatist insurgency. But local people say they find it hard to believe the insurgents would have attacked fellow Muslims in such a way. Separatist violence in the region has caused more than 3,000 deaths in the past five years, and there has been a recent upsurge in violence. Eyewitnesses report that the five or six gunmen disguised themselves with ski masks when they attacked the mosque. The BBC's South East Asia correspondent, Jonathan Head, says the provocative nature of the attack raises questions about exactly who was behind it. Local villagers have said they find it hard to believe the insurgents would have carried out such an attack on Muslims while they were praying. But a spokesman for the regional army command told the BBC it was impossible that any military units were responsible. Thailand's army chief General Anupong Paojinda told reporters that the insurgents were trying to pin the blame for the "barbaric act" on the authorities . "They absolutely want to raise this issue to a level of international concern, by making it seem like state authorities are violently cracking down on villagers," he told reporters, before leaving Bangkok for Narathiwat. After more than a year in which the military seemed to be making progress in curbing the insurgency, the number of attacks has suddenly spiked over the past two weeks. The insurgents remain in the shadows, never stating their demands, our correspondent said. Comprising young men recruited by local Islamic preachers, the small cells of fighters launch hit-and-run attacks on soldiers, government officials and Thai Buddhists almost at will, he adds. Much of the south is now a no-go area for the army, and the mainly Muslim population is deeply mistrustful of the government. Prime Minister Abhisit Vejjajiva has just finished a visit to neighbouring Malaysia, where he sought co-operation in sealing their shared border. But this conflict - where both the insurgents and the security forces benefit from rampant smuggling - is too complex to be resolved by diplomacy alone, our correspondent says. Thailand annexed the three southern provinces - Narathiwat, Yala and Pattani - in 1902, but the vast majority of people there are Muslim and speak a Malay dialect, in contrast to the Buddhist Thai speakers in the rest of the country.